Despite the reason for kayaking on the Big River being getting to those places where ‘man’ is not evident, we define our journies by those ‘interventions’ by men, ie, the bridge at HwyM, at HwyU, the Iron Mtn RR trestle, the low water crossing at Leadwood Access. 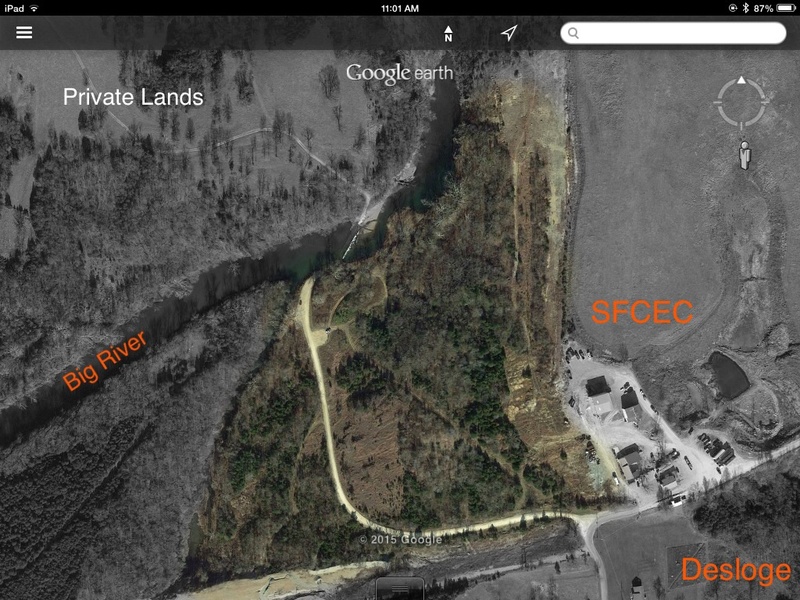 Other interventions are evident along the way like old gravel quarries. Even at its source the Big River is defined by the man made Council Bluff dam & lake that coverr over the the springg that is the source of the Big river. They all have impacts on the environment, some positive, some not so positive, but they are a real part of the experience. It is nevver so evident as at a place like Bone Hole. Bone Hole is a public river access that many people have fond memories of but dare not go there today for safety reasons. Even though I know several groups work at keeping it clean, it is always trashed every time I go there. It is known for a tough crowd that frequents it, and an even tougher crowd that clean it. Oddly, the things that are most engaging about the site are man made. The first that comes to mind is Mina Joe Creek that was channeled into a 10’by10′ tunnel carved into the Bonne Terre formation (geologic strata) that allows water to drain the area around the original Mina Joe surface lead mines dating way back to the 1700’s. The tunnel was built when the St. Joe Co. began impounding tailings in the acreage to the east, now used by the SFCEC (St. Francois Cty Environmental Corporation) as a landfill for inert biosolids. The tunnel always emits a cool breeze on even the hottest of summer days and the water that drains out of it has created a delightful staircase of eroded rock. It’s fairly magical. Another man made oddity on an out of the way corner of the site is a wetland where no wetland belongs, but exists because of an old rusty pipe (originally a bore hole drilled in the search to define the extent of lead underground). It has spewed water for years & years and by its diligence has rewarded us with a beautiful little wetland. The low water crossing is another man made element. It impedes kayakers (silly fools just passing through) like me, but is a delight for the fishermen and people that just like to hang out by water and imbibe their favorite beverage. Again I was stumped at how to get around this obstacle, until an elderly gentleman drove up and suggested I try the other side. We chatted for a while, found out he new Desloge City Administrator Greg Camp as do I, and that he had a spot on the Desloge Planning & Zoning board, and took very seriously his responsibility of moving to adjourn every P&Z meeting. He was a very sweet gentleman and his advice was perfect. Not all the beauty onsite is man made. There is the dolomitic glade that shows no presence of people because it is a hot place in the environment, with sharp coarse rock that is not pleasant to walk on. There is also a bluff that is like a magnet for kids to climb and tempts the daring to jump off. DON’T, unless you desire a future life completely paralyzed, at best. Posted on April 21, 2015 April 21, 2015 by jaydoty	This entry was posted in Uncategorized. Bookmark the permalink.